I have both Windows 7 and Ubuntu installed on a shared machine. Because a lot of the non-developers use Windows, I'd like to change the boot order to make it easier for them. How do I change the default order so that Windows 7 is at the top of the list? 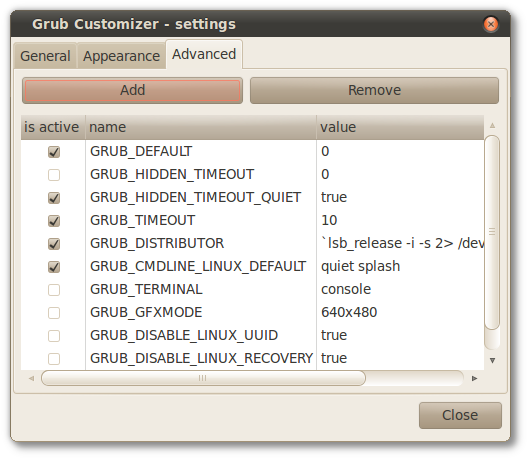 You can use an easy-to-use the GUI application called Grub Customizer to make your life a little bit easier. As the name suggests, you can do much more than just reordering GRUB menu entries with it. There is an How-To Geek article about it, How to Configure the Linux GRUB 2 Boot Menu the Easy Way. Take a look at it if you're interested. Also, there is a solved thread on the Ubuntu Forums, Change boot order in GRUB 2 that mentions this tool. 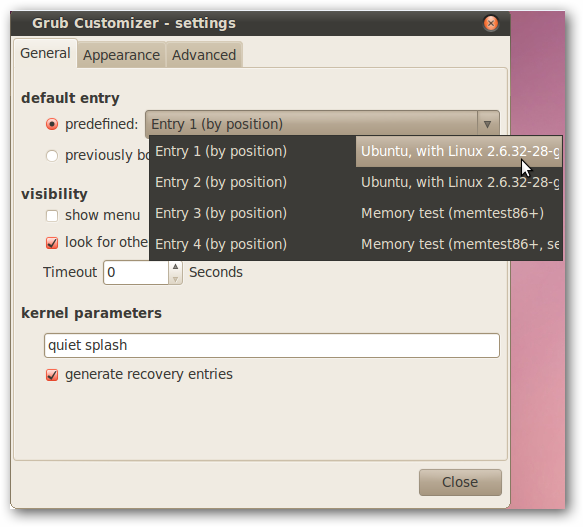 The Grub Customizer settings may work only from within the latest Linux/Ubuntu installation, the one that installed the Grub. 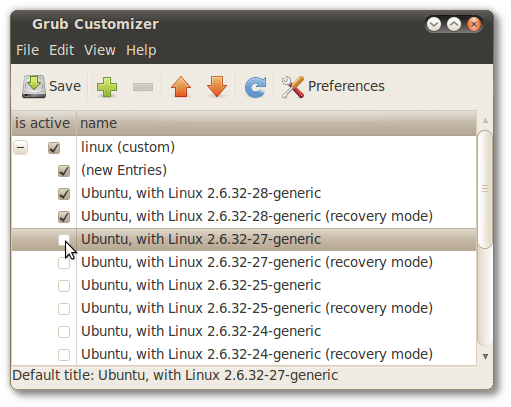 For example, if somebody has two OS-es installed (Windows and Ubuntu), and then installs a third OS (Manjaro, etc) and then tries to follow the above answer, Grub Customizer changes will not work when made from the second OS (Ubuntu, in the example). The program has to be installed in the thirs OS, as it seems that Grub Customizer can only edit the Grub files created by the installation of the system on which itself is installed. The files that determine the Grub boot menu come in most cases with the latest system installed on a machine, so Grub Customizer has to be installed and used from that Linux system. You can also change the grub default boot entry from the command line without having to install any additional tool. This won't change the order in the list but it will allow a different OS to boot by default, which sounds like what you may want anyway. if there was a menuentry 'Ubuntu' line on /boot/grub/grub.cfg. This may be a better method, as it does not depend on the order of the entries, which could change. The line GRUB_DEFAULT=0 means that GRUB will select the first menu item to boot. Change this to GRUB_DEFAULT=saved. This change will make it easier to change the default item later. The configuration change we made allows the grub-set-default and grub-reboot commands to be used at any time. These allow you to change the default boot item permanently or only for the next boot, respectively. I tried the following and got good results. Type sudo gksu nautilus and press Enter. Type in your user password. Navigate to the file /boot/grub/grub.cfg. Copy and Paste the file into same directory, should create copy of the grub.cfg file for backup purposes. Then double-click grub.cfg to open the file in a text editor. In the file you will find the line (set default="0"). Edit the 0 to the line number in Grub that you want to load. Mine was the sixth line, so I used 5, as the first line is considered 0. Save the file. Reboot the pc and if you chose the correct line it will be the highlighted one when Grub loads. Open up a terminal window (Ctrl+Alt+T), or press Alt+F2. Type gksu nautilus and press Enter. That will open up the file browser Nautilus with permission to change files owned by root. Navigate to the file /boot/grub/grub.cfg and double-click to open the file in a text editor. Cut, move and paste the sections in that file that belongs to different operating systems. You must be very careful when doing this, as if you do it wrong then you won't be able to boot anymore. Windows boot can always be repaired with the tools from a windows installation disc (FIXMBR), that overwrites GRUB-MBR with a typical Windows-MBR. I have tested it from Ubuntu 9.04 to 12.04 and it has worked fine every time. But I have only tried to move the Windows boot section to the top of the list to make it become the default. If my memory is correct, each boot menu section in the file starts with a begin ... and ends with an ...end. And spans multiple text rows. The text in that file has become a bit more complicated and it doesn't look the same in the last Ubuntu version as in previous versions. So use your brain to save you from doing a mistake. Not the answer you're looking for? Browse other questions tagged boot grub2 or ask your own question. How do I change default boot kernel if I set it wrong to memtest? How to set default boot kernel in Ubuntu / Grub? How can I change the boot order (grub2)? How do I alter/customize the GRUB boot menu for Ubuntu 12.10? GRUB not installed correctly by ubuntu server manual process? How do I change the boot order for Ubuntu?